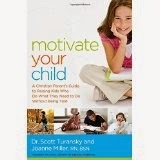 Just the blurb for this book drew me in - what an important and vital topic for christian parents today! This book was like water for a thirsty soul, getting back to raising children to have integrity and character, to be motivated internally, to listen to their conscience and do the right thing because it's the right thing and not for some external reward. This book has practical applications on how to achieve these qualities in your children and how to guide them to be people of integrity and of good character. It encourages families to have family time and bond in relationship with your children, to interpret the scriptures for them in a way they can understand for their level. How to develop initiative in children where they do things without being asked is another important quality covered in this book. I really enjoyed this book, as I said above it was refreshing! I would recommend this for all parents training up their children in the Lord. It's a fantastic tool to guide you through! Please note: Booklook sent me a copy of this book for review however my opinions are my own.